Clean and rinse the peas en let them soak for 24 hours. Clean the leek, celery and onions, wash thoroughly and cut in large chunks. season the soup towards the end of the boiling time. Remove the meat and cut it up in bite-size portions. Remove the laurel and blend the soup well. Add the meat pieces and boil for another ten minutes. Can be served with croutons. Peel and chop the onions. Let them soften in a mixture of melted butter and oil. Do not allow them to brown! Count on 40 minutes at low heat before the onions are tender. Keep some onions on the side. Sprinkle lightly with flour and add white wine and stock. Season according to your taste. Cover the casserole and allow simmering for 30 minutes. Cut the breads and grill in the oven. When the soup is ready, add the port wine. Put some onions in every bowl and pour soup on top. Cover each bowl with a slice of grilled bread. Sprinkle with the grated cheese and put under the grill until melted. Serve hot. Melt some butter, add the butter and under constant stirring add the chicken stock. Season this mixture well. Then add the mushrooms and chicken meat and allow the to heat. Meanwhile, heat the pastries in the oven for about ten minutes and stuff them with the chicken mixture. To be served as a starter or as a main course with chips. Choose nice and round tomatoes, and cut off the top slice (to be used as a cover). Scoop out the tomato meat and empty as much as possible. Sprinkle the prawns with lemon juice and mix with the mayonnaise. Stuff the tomatoes with this mixture. Finish off with some parsley and the tomato cover slice. Serve along some salad or watercress. Melt some butter in a large pan and fry the meat until nicely brown, season with pepper and salt. Add the onion cut up in rings, the finely chopped charlottes, and the garlic and paprika powder. Stir well and fry until the onions are tender. Add the beer until it covers the meat. Then add the thyme and laurel leaf and stir again so everything mixes well. Finally cover the stew with the slice of bread and mustard. Cover the saucepan and heat at low temperature. Allow simmering for at least 1,5 to 2 hours until the meat is really tender. Serve with chips and cool lager beer. Melt a nice chunk of butter and gently fry the chicory until brown from all sides. Then turn down the cooker, cover the saucepan and simmer until soft. Meanwhile prepare a béchamel sauce with butter, flour and milk. 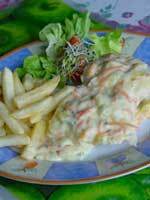 Melt in this sauce the soft white cheese and season with salt, pepper and nutmeg. When the chicory is soft, roll them in a slice of ham and put in an oven dish. Cover all of them with the cheese sauce and cover on top with grated cheese. Place in a preheated oven at 200° C during 30 minutes or until golden brown. 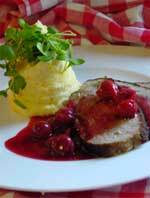 Serve preferably with potato puree. Cut the chicken in 8 pieces. Cover the bottom of the saucepan with butter. Chop the vegetables in bite-size pieces. Put all the vegetables in the saucepan and cover with the chicken. Season and add the chicken stock. Boil for about 45 minutes until the chicken is tender. Softly mash the carrots until puree. Add back to the soup. Heat a serving bowl and beat the egg yolks in it. Then slowly add the chicken stock and keep on beating. Lastly add the vegetables and chicken to the serving bowl. This recipe is meant to be a main course meal, even though it is a soup-like dish. It is traditionally served in deep plates with a spoon (to eat the soup) and fork and knives (to eat the meat and the vegetables). Often one serves boiled potatoes on the side, and always fresh bread and real butter. Many variations of this recipe exist, mainly concerning adding other meaty ingredients to the chicken broth. Mix the mincemeat, the chopped onion, nutmeg, egg yolk, parsley and chapelure in the kitchen robot. Roll this into a nice meat loaf and turn it lightly in chapelure. Allow resting for one hour. Melt a piece of butter and brown the meat loaf from all sides until crisp. Then turn down the heat and let it cook at low heat for enough time. Meanwhile pour the cherries with their juice in a saucepan, add the gin and the cinnamon stick. Heat the fruit slowly and keep heated for about 30 minutes. Then remove the cherries and reduce the juice before putting them back in. Cut the meat in slices and serve with a portion of cherries. Cut the eel in pieces of 3 to 4 cm. Chop all spices. Fry the eel with the onions in butter for a few minutes and stir continuously. Add the green spices and as much water to cover to fish. Season with salt and pepper and boil gently for 8 to 10 minutes. Beat the egg yolks with potato flour in a bowl, add the lemon juice and some salt. Add some of the hot fish stock, while stirring well, until the sauce thickens. Then add the eel and the vegetables, turn well, and the dish is ready to be serves. This dish can be served hot and served with chips, or cold and is then served with bread. Wash the mussels, remove any that are open, remove also any dirt on the shells. Allow them to rest for about one hour in slightly salted water. After half an hour before cooking, rinse the mussels again and put them in water to which you have added a little flour. Melt some butter in a large sauce pan and fry the onion and the celery. Add the wine and allow cooking for a moment. Now add the mussels, adding also salt, pepper and some chapelure. Throw the mussels up and then heat at high temperature until all shells have opened. 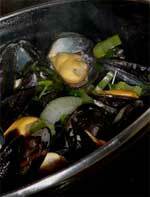 Remove the mussels from the saucepan and add cream to the cooking liquid. Stir and allow thickening. Pour the sauce on top of the mussels, serve with chips and a glass of white wine. You want to dip your mussels? 1 teaspoon mustard, 1 spoon vinegar, salt and some cooking liquid (before adding the cream). Turn well - ready to serve! Allow the meat to boil in water with pepper and salt until almost tender. It depends on the type of meat how much time you need to allow. Then add the vegetables and the potatoes. Count on two hours of additional cooking. Fry the bacon in a separate pan. 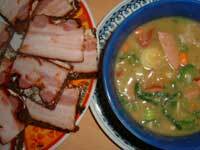 Remove the boiled meat from the big saucepan and put aside with the bacon. Gently mash the potatoes and the vegetables (not so much as to turn them into puree), add the meat and bacon and turn around before serving. To be served with bread on the side. Melt a nice chunk of butter in a large pan quickly fry the cubed bacon. Remove and keep on the side. Now use the same butter to fry the rabbit so that it browns on all sides. Add the bacon to the rabbit. Then add the onion, laurel and peppercorns. Season well with pepper and salt. Pour the beer until all ingredients are covered and turn down the heat. Allow simmering for 1 hour with cover on top until the meat is tender. Remove the rabbit from the saucepan and keep warm. Thicken the sauce and add fresh parsley. Pour the sauce over the rabbit and serve immediately. Can be served with boiled potatoes and applesauce. Melt the butter in a pan and add the rice. Stir well. Pour the milk, but keep one cup on the side. Boil and then turn down the heat. Allow to softly simmering for about 30 minutes. Stir regularly. Mix the vanilla flour in the cup of milk and add to the rice mixture together with the egg yolks. Allow cooling, and only then adding the vanilla sugar and beaten egg whites. Pour this mixture in a greased cake mould of 25 cm and bake in a preheated oven of 180° C for about one hour.